The most common causes of tooth discoloration are caffeine, cigarettes, and aging. One of the best things you can do for your smile is to brighten it up! Teeth whitening dentistry has taken off in the last few years, with Newport Beach cosmetic dentist Dr. Yazdan at the forefront of its popularity. Whitening dentistry involves a variety of options, such as in-house bleaching, laser whitening, and at-home bleaching products. Dr. Yazdan looks forward to discussing your options with tooth whitening. During the initial consultation, she will address your concerns and you will be able to ask her any questions you may have. Tooth whitening is not a permanent fix, but with great improvements to your smile, the long-lasting effects prove to be beneficial and a positive experience. With Zoom!, your teeth can be dramatically whitened with little to no inconvenience to you! In just one short office visit, your teeth can be transformed from dull and discolored to beautiful and bright! Many teeth whitening methods cause your gums to feel irritable and sore. With the Zoom! whitening method, irritation is minimal, but the results are significant. Research has shown that Zoom! 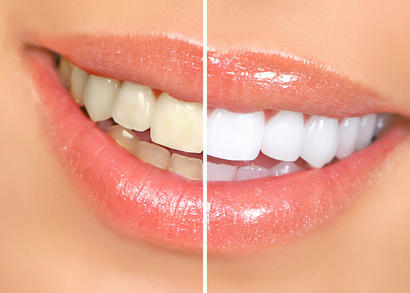 teeth whitening system can whiten teeth up to 8 shades lighter when used in conjunction with the high intensity Zoom! light. Getting your smile that much whiter in less than an hour with little irritation, makes Zoom! a great choice for brightening your teeth. Zoom! is a one-hour in-office bleaching treatment. This method of teeth whitening requires a short preparation period where your mouth and gums will be covered. The Zoom! bleaching solution is applied and the special Zoom! lamp is shined onto the teeth. This process is done in four 15 minute sessions. You can have teeth several shades lighter in about an hour. The outcome is a mouth full of pearly whites that will make you want to smile a whole lot more! Zoom! is only one of the teeth whitening methods available at Dr. Yazdan’s cosmetic dentistry office in Newport Beach. She also offers home bleaching, laser bleaching and other cosmetic dentistry procedures like dental bonding or porcelain veneers. You can schedule a free consultation to learn more about Zoom! and other teeth whitening procedures so you can have the bright smile you’ve always wanted. Zoom! tooth whitening can improve your smile and your self-esteem! The sooner you come see us, the sooner you can have the dazzling teeth you desire! Dr. Yazdan and her team provide a full range of dental services from cosmetic and restorative work to disease prevention and dental hygiene. Whether you are interested in dental hygiene, general dental services, cosmetic dentistry or dental implants, schedule an appointment with Dr. Yazdan today for an evaluation. During your first meeting, a comprehensive oral examination will be done, and a full set of digital X-rays will be taken. After an examination, Dr. Yazdan will present all of your treatment options. © 2018 Center for Restorative & Cosmetic Dentistry. All Rights Reserved.